To reach KMC, travel south on Hwy.11 and turn into the main entrance of Hawaii Volcanoes National Park located between mile markers 28 and 29. 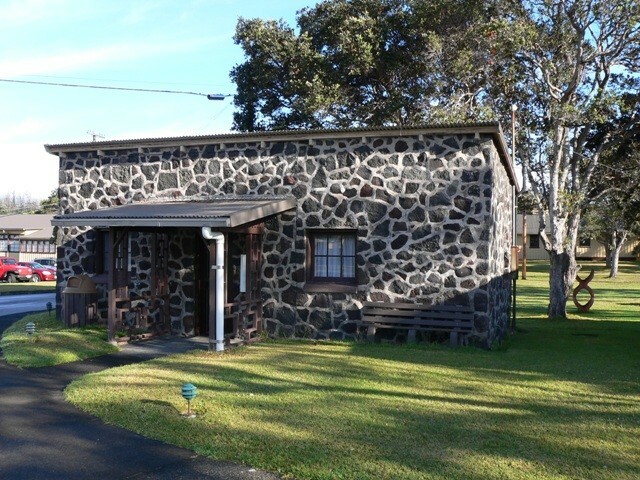 Drive one mile past the Kilauea Visitor Center on Crater Rim Drive to KMC. 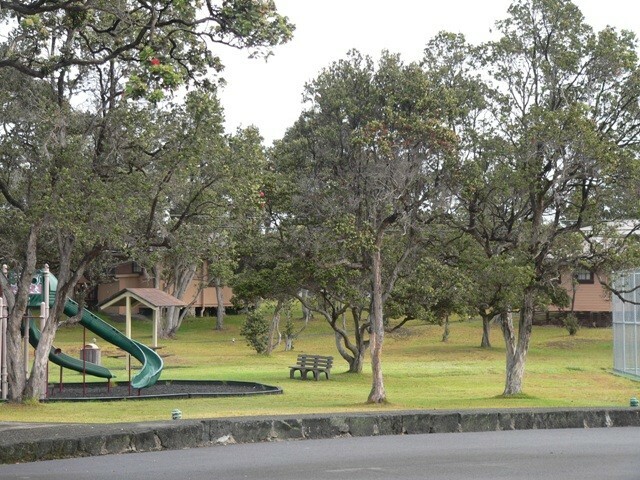 There is a grassy front lawn and lava rock wall at the front of the camp. The Front Desk is located in Building 40, the main headquarters. Travel time from Hilo Airport is about 1 hour and from Kona International Airport approximately 3 to 3 1/2 hours. 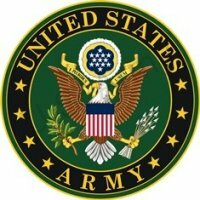 Active, National Guard, Reservists, Retired, 100% DAV, DoD, Guests. Accepted up to one year in advance. Can check availability online. Reserve by phone, email, postal mail, or online at http://www.kmc-volcano.com/reservations.asp. WiFi available in the lodge. 2 week stay limit. Prices vary based on rank and type of rental. This is our 4th visit to KMC (first was 1973). It's a wonderful relaxing place. Our cottage was fully remodeled, nicely furnished, and spotlessly clean. 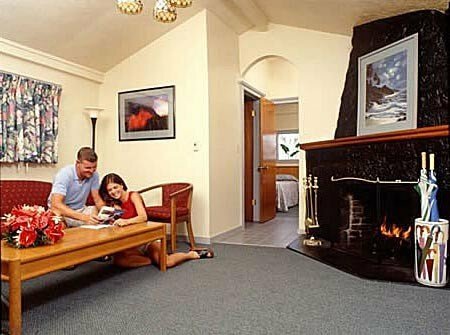 We had a very nice living room with a fireplace, and a large bedroom with a king size bed. Weather was mostly cool and sunny with just one evening with showers. We visited the Jagger Observatory three times, twice at night and were thrilled with the volcanic display. We found the dining hall food reasonably priced and fairly good. We had a nice lunch at Volcano House about two miles, great view of caldera and smoking volcano. Hilo was only one hour drive with lots to do and see. The ranger-lead hike of Kilauea Iki crater was excellent. 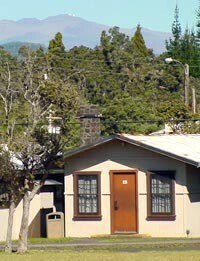 Regarding price, we paid $115/night; rooms at Volcano House start at $240 - I checked. We enjoyed a Hawaiian show on Friday night in the small KMC club. Definitely hope to return again. We stayed here back in 2011 and we thought the cottages and facilities were great. We had an older stone one bedroom cottage that could have used an update but it was very clean and roomy. We liked staying in the Volcanoes National Park with its cool mornings and lush surroundings. If you are wanting to be in the middle of the happening island life of the beaches, this place isn't for you. We had a rental car and you could drive to any part of the island in a relatively short drive. It is very close to the Black and Green Sands beaches. We ate every breakfast at the dining facility and thought the food was very good and loved the convenience of being able to walk there from our cottage. We also liked that it had a small annex that had a fairly nice selection of items which meant you did not need to make a trip to town if you needed something. We thought the prices were very reasonable for where we were staying. Overall we really enjoyed our stay at KMC and will definitely stay there again if we ever find ourselves on the Big Island again. we drove up to investigate on the chance we'd like KMC better than the place we were staying on the "big island". Beautiful location & mntn scenery. We ate breakfast in the chow hall, shopped at the PX, visited the rest of the facilities and the old review is correct-it's a peach. Everything you'd need if you were staying there. However, the prices were not all that good compared to those on the "economy". We rented a house for $500 a week and that wouldn't get us 4 nights at KMC. I don't understand the whole NAF pricing structure. The longer that I'm retired, the higher the prices for retirees' activities seem to get. An active duty officer might be able to afford to pay $200 a night for a room, but a retiree? We only make 50% of our old base pay. At KMC you're too far from everything. And remember rental cars in Hawaii are super expensive. We paid $300 for 2 wks PLUS $175 extra in taxes. You're stuck; way too far from everything at KMC w/out a car and gas was >$4. We could never afford to stay at KMC. A.C. left this review using the Directory software: We've visited the Kilauea Camp (KMC) several times. The "cabins" as listed on the web site are cute and most have been updated, although nothing fancy. Kilauea is at 4000' elevation and it can get cool in the winter mornings, so bring a sweat shirt and rain coat (the Camp is also located in a rain forrest). The offered tours are great if you didn't rent a car (KMC will pick you up at the airport if arranged in advance) and will give you a good prespective of the Island. If you're interested in volcanic activity to to the volcano web site ( a link is on the KMC web page), we've had some outstanding trips to the lava flows, check with the office for instructions and flashlights. They also have a chow hall if you don't want to break the bank eating out. 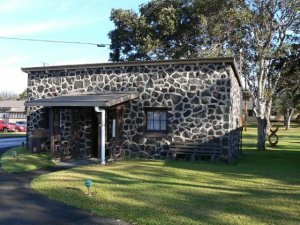 Great central location for exploring the Big Island!